In a previous post I showed pictures of pantry shelving we were building to enhance the client’s use of an empty wall. Here is the finished product just prior to the client loading it up which demonstrates that even a pantry cabinet can be attractive when done properly. Prior to this being installed, it was simply an empty wall serving as a mud room between the garage and kitchen. 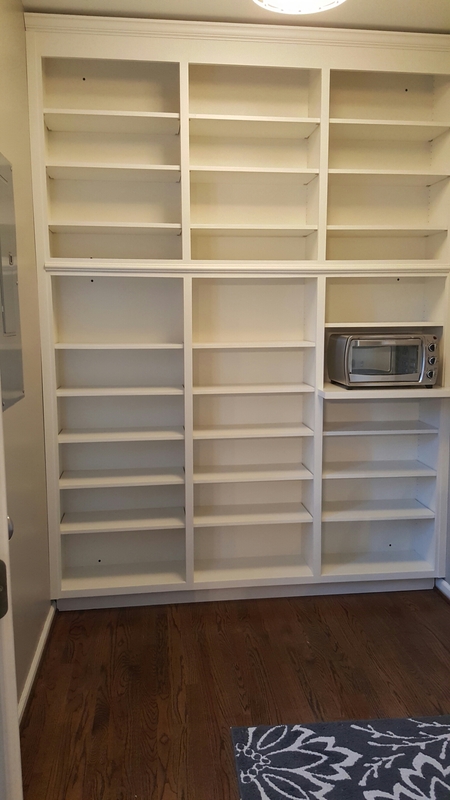 In filling this wall with pantry shelving the client created significantly more kitchen storage space with a minimum impact on the overall footprint of the room. The shelves only protrude 12 inches outward from the wall. Al of the shelving was made such that it can be adjusted to accommodate a variety of size items. Additionally, we added a little flair by breaking the piece into a top and bottom and trimming out the middle with some nice molding. This breaks up the large piece nicely and takes it from the ordinary to an attractive addition. This is what floor to ceiling custom built pantry cabinets look like in their early stages. Yes, I know this isn’t the most attractive part of building cabinets but it is the most important. Quality cabinets all have good “bones” and these do. I thought I’d show you these cores and point out a few of the details that make them higher quality. First off all pieces – tops, bottoms, sides and backs are “dadoed” into each other. If you don’t know what this means follow the previous link for an explanation. Once you’ve seen that you’ll understand why these are such high quality cabinets. 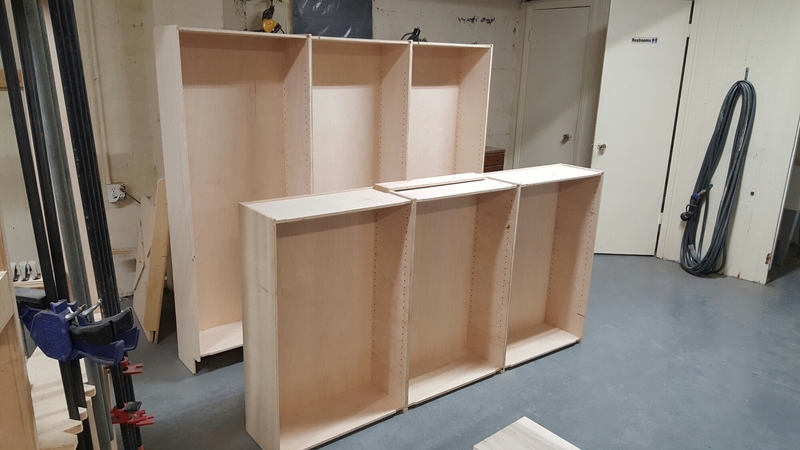 Rarely will you see this done in cabinetry, but its something we make standard as part of the building process at our company. They aren’t just glued and nailed. In this case we decided to break the cabinets into an upper and lower. We did this for several reasons. One – we had to get them in the house! But also, by breaking them into a top and bottom we can add on some nice molding in the middle that breaks things up and allows visual appeal. Notice on the taller cabinet (which is the bottom section) we also built a toe kick. This allows the owner to stand very close to the unit when reaching up on the higher shelves. Plus you don’t see all the kick marks from shoes. Check back on later blog entries to see the finished, installed product.